Tutors are from your university, have taken the same classes and even the same professors as you! We have a 5-star rating system that helps you choose which tutor meets your standard. The first 10 minutes are FREE. Toucan offers a variety of tutors to select from, find the right one for the right price every time. 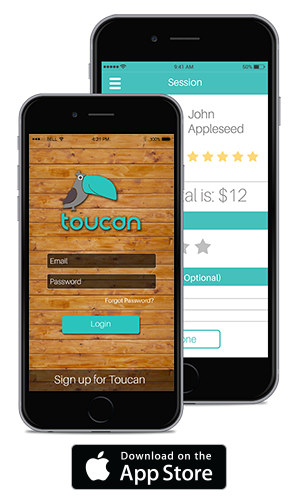 Toucan wants to make sure that all of it's users are students at your college. When you sign up we need your school email address so we can send you a verification code to make sure that you are a student at the university you identify with. Once validated, you are ready to get the help you need. We think all students should have access to the help they need. So we make it easy. Browse through a list of tutors that are in your class or have taken your class, you can even see which once are instantly available or offline. Interested in becoming a tutor on Toucan? Click here! Once you have found the right tutor meet face-to-face and get the help you need. We plan on expanding your interaction through many different mediums. Use the in-app timer to keep track of session so you can focus on the important stuff. Our in-app payment process creates a stress free environment. Students don't need to waste time pulling out cash and tutors don't have to chase students for money.